Medium-sized seabird (L 55 cm), bill usually points slightly upwards. In the breeding season, the throat plumage becomes winered. Neck and head are grey. 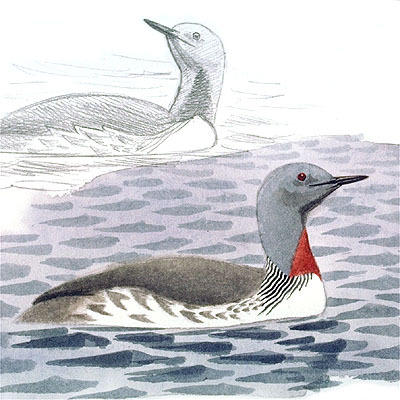 In winter, pale grey of head and back merges into white of neck and breast. Birds feed almost enterely on fish. The main winter habitat is open sea, often far from land. The species is migratory. Between 1970 and 1990 numbers declined over a considerable part of the EU. The loss and deterioration of habitats (land drainage, decline of fish stocks, water pollution and mercury levels in fish) and disturbance at breeding sites are the major threats which the species is now facing.